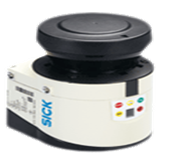 The position and orientation of the sensors have been measured manually. 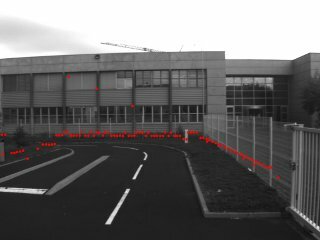 Sensor coordinate frames are relative to the vehicle frame origin. 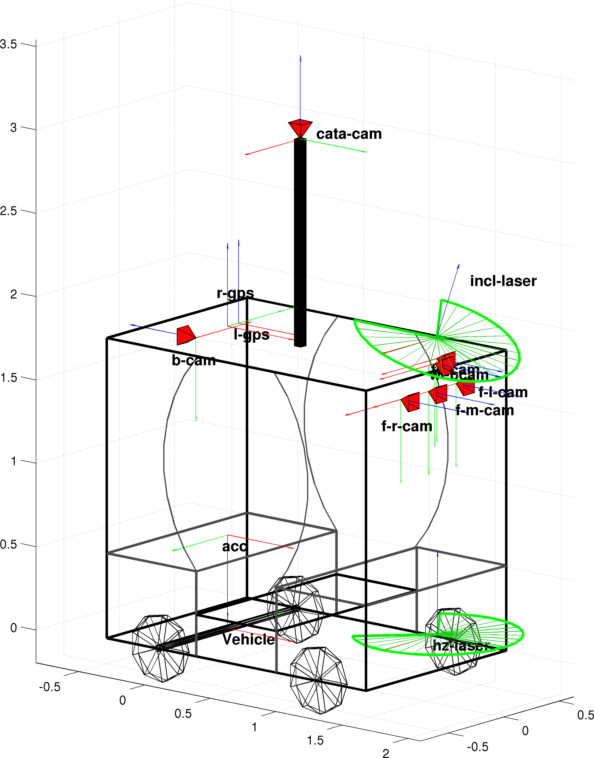 The vehicle frame is such that its origin is in the middle of the back rear axle, the X axis is horizontal in the ongoing direction, the Z axis is vertical and the Y axis is confounded with the rear axle, completing the direct frame. The numerical values of those transforamtions are given with a right-handed "RPY" Euler angle parametrization of SO3 using a fixed axis interpretation, in [ X Y Z Roll Pitch Yaw ] format. All rotations are in radians and translations are in meters. The rough values of the extrinsic parameters are listed below. 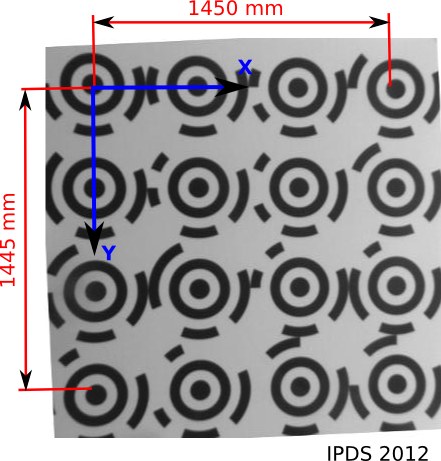 For each camera, images of two planar calibration patterns have been acquired. 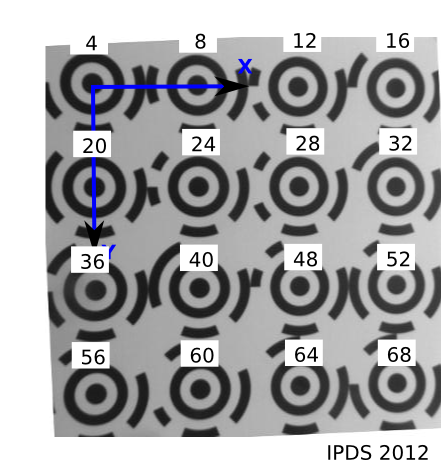 One pattern contains circular landmarks with a black bullseye and a circular code. These landmarks guarantee a subpixel detection. 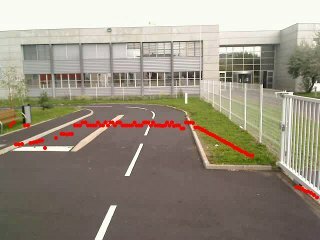 An automatic feature detector allows to accurately estimate the landmarks’ center and their label. 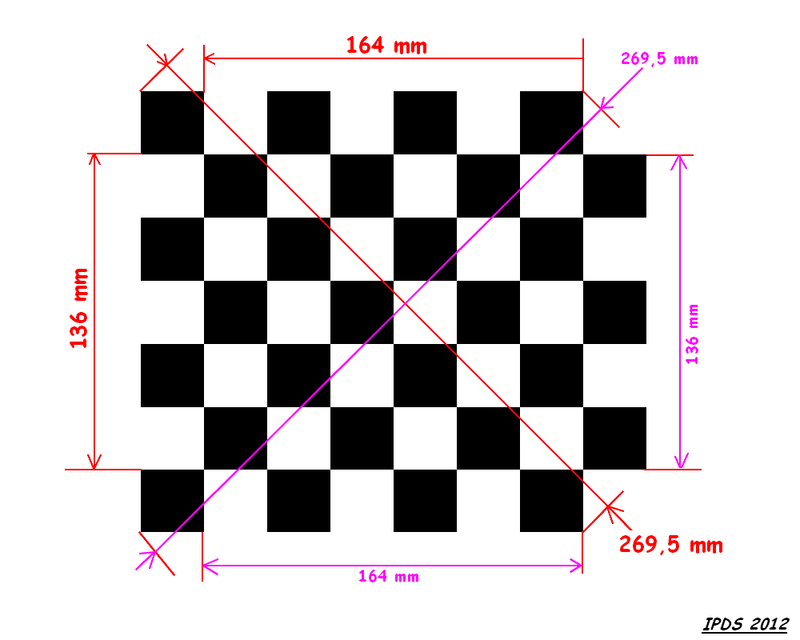 The second pattern is a classical chessboard. 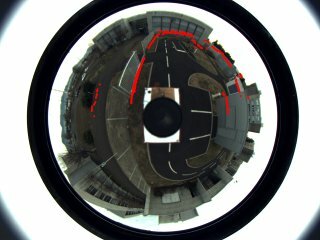 Those images have been used to estimate the parameters of a suitable projection model: pinhole model with polynomial distortions' model for perspective cameras and the unified model on the sphere for the fisheye and the omnidirectional cameras. The skew is supposed to be equal to 0. Tangential distortions and radial distortions up to the 5th degree are considered. The skew is supposed to be equal to 0. 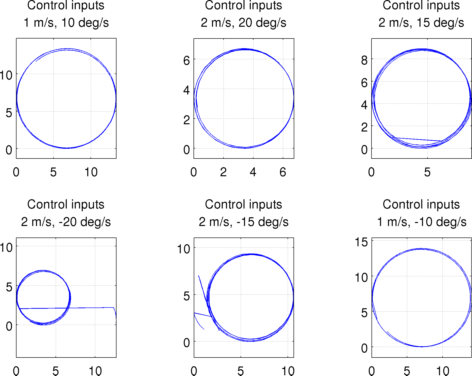 Tangential and radial distortions are set equal to 0. 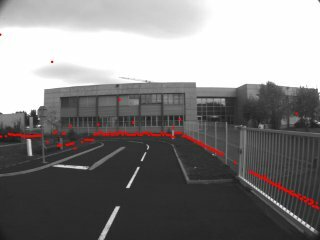 If the user uses a different projection model or wants to calibrate himself the camera, we provide images of the patterns (refer to the page Downloads). 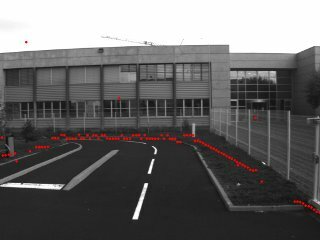 Reprojection of the impacts detected by the horizontal range-sensor in the images from the different sensors using the transformations and intrinsic paramaters of the cameras provided above. 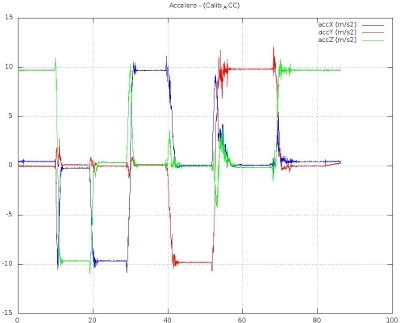 The RADLOCC Laser-Camera Calibration toolbox has been used ( [Kassir10] ; website). We carefully follow the advices from the toolbox authors. Changes to the background remain as minimal as possible. The calibration board has not been rotated more than 45 degrees about its orthogonal axis. 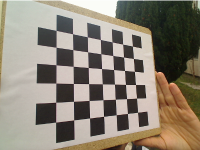 Finally, the board's position was moved around as much as possible throughout the dataset. 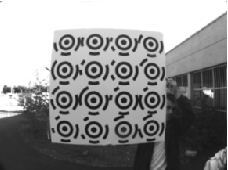 The camera calibration provides the orientation and position of the calibration plane (using as for camera calibration a pattern with circular landmarks with a black bullseye and a circular code). where Δ is the translation offset and Φ is the rotation matrix as defined in RADLOCC, the second matrix beeing the coordinates transformation. 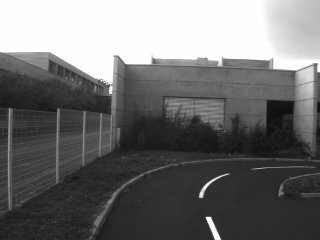 Images and RADLOCC-like structures are provided. Some sequences have been acquired driving the vehicle at constant velocity and steering angle. DGPS data are provided. 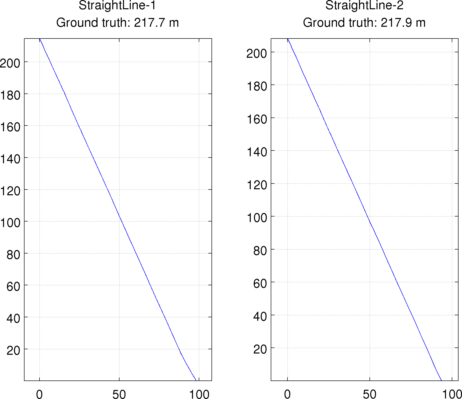 We provide also 2 sequences with the vehicle droved in a straight line. 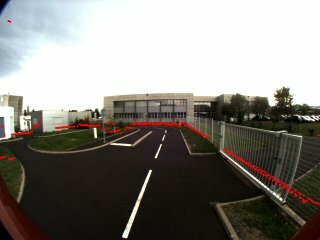 The total length of the paths have been measured with a measuring wheel. 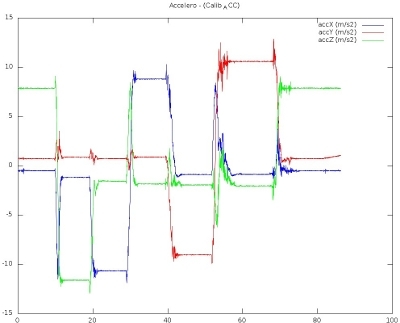 To estimate the parameters, we moved the accelerometers such that the gravity is aligned with each axis some seconds.